First Class on domestic flights can be a bit of a joke, offering luxury commensurate with what regular passengers used to get. This Sunday, jetBlue will change the cross country long-haul game with the launch of their new Airbus A321. It's cheaper than most first class trips and, as I found out, nicer in many ways. What makes Mint Class so special? These new planes are the first for jetBlue to be configured with fully lie-flat seats up front, as well as their new Fly-Fi internet service and a few other features to make their already well-liked longer flights even better. Their low-cost competitors such as Southwest, Spirit, and Virgin America have nothing like it. Virgin America does have what they call First Class, but it doesn't recline completely flat, or offer any element of privacy like jetBlue's Mint. How do you spot a Mint plane from afar? Look for this unique tail design. Mint planes are the only ones in the fleet with green on the tail. The big guys, or so-called "Legacy Carriers" like American, Delta, and United have domestic first class, but their product can be hit-and-miss since they fly so many different aircraft types. Nobody likes to have their expectations met with inconsistencies. JetBlue's Mint also undercuts their legacy competitors by hundreds of dollars, starting at only $599 each way. I priced a LAX-JFK round trip from July 7-11th. 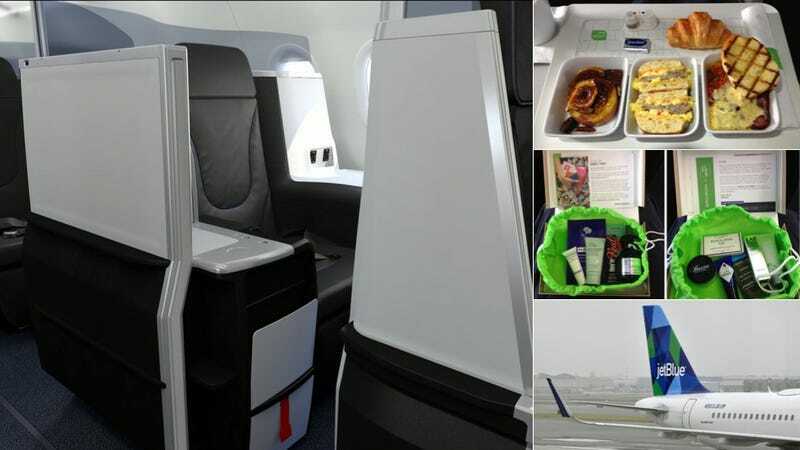 JetBlue's Mint seat was $1,398 ($599 one way, $799 the other way — because the $599 fares were sold out) while American Airlines' new Airbus A321T Business Class will run you $2,033. So let's look at why you want to experience Mint the next time you fly coast to coast. Once you're seated at one of the sixteen Mint seats, you're offered jetBlue's new signature cocktail — a honey infused limeade with vodka and mint, garnished with a mint leaf, naturally. I enjoyed a couple of these. They're sweet and refreshing, and tasted very much like a mojito. Your seat welcomes you with a duvet blanket and headphones. I found the headphones to offer a good quality sound, though they weren't the most comfortable I've ever worn. The headphone comfort prize would go to the Bose QC-15s on American's Business Class, but given a choice of saving hundreds of dollars or having comfy headphones for a few hours, I'd pick Mint on the same route. Four of the Mint seats on each plane are Suites, with a private enclosure, aisle access, and extra workspace next to the window. The seats are the same width but you have so much more space, and get this — the Suites are the same price as the other Mint seats. So the lucky few who are the first to book the flights are rewarded handsomely. The fully lie-flat beds extend up to 6'8" making them the longest in their class. The four Suites have the only private closing doors in the U.S. market. Each seat, designed by Thompson Aero, has charging outlets for power cords and USB. Your inflight entertainment system is controlled by a remote control that's wired into your armrest. Touchscreen functionality will be added to the screens in the near future. Your seat control functions are also right at your side. In addition to adjusting the recline of your seat, you can adjust the firmness of your cushions and lumbar support. The seats include a massager as well! This is something I've only heard about the international luxury airlines having, and to my knowledge it's a first-time offering from a U.S.-based airline (although let me know if you've seen this). A storage pocket is located right under the 15-inch TV screen, from which you can choose from up to a hundred DirecTV channels, on-demand movies, and SiriusXM radio channels. Gourmet airline food may seem like an oxymoron, especially since jetBlue has never offered more than snack boxes or pre-packaged sandwiches. But they've really nailed the menu on the first try. It includes offerings from New York's Saxon & Parole restaurant. Since our "flight" was late morning, we were served the Brunch "NourishMINT" menu. Each menu includes 5 entree choices, and you get to choose three of the five. I chose (from left to right, above) the french toast with figs & toasted pecans, the cheese & chive biscuit sandwich, and the scrambled eggs with a slab of bacon & vegetable ratatouille. The portions were sized just right, and I was comfortably full before dessert arrived. Dessert was a lemon honey sorbet from Brooklyn's Blue Marble Ice Cream, along with a fruit salad. Mint passengers also receive an amenity kit by Birchbox full of things every traveler could use, such as lotions, stain removal kit, and lip balm. JetBlue fans love their unlimited free soft drinks and snacks, including those famous blue potato chips. The Mint fleet has a new walk-up snack center, with chilled drinks and additional snacks you can grab any time during the flight. This is available to everyone on board, even back in the cheap seats. On the Mint fleet, JetBlue has also upgraded the Economy section, which they call their Core product. These changes will also be brought to their workhorse Airbus A320 aircraft in the future. The comfortable new black and gray leather seats feature headrests you can adjust and use as a pillow, versus flopping around like a bobble-head or leaning against the cold, hard window. In economy, jetBlue has two offerings. Their "Even More Space" seats have a gratuitous 41-inch seat pitch on the A321 and 38 inches on the A320. Contoured armrests will give passengers more room for their bellies, and all seats will have access to A/C power outlets. Any airline that doesn't offer power outlets for longer flights these days is foolish. The Mint planes aren't the only ones in the fleet with generous amounts of legroom. Besides the eleven A321s in Mint configuration, jetBlue will also fly nineteen other A321s on high density routes. However, comfort will not be sacrificed. Even in the Core economy seats, legroom will be at least 34 inches. JetBlue's smaller Embraer E190 planes will all have at least 32 inches of legroom for economy passengers, which is still higher than the 31-inch industry average. Economy seats receive larger 10.1-inch screens, with access to 36 DirecTV channels and 100+ SiriusXM channels. Each seat also has a drink holder, down next to the storage pocket. The new seats have been designed to increase comfort while also reducing the overall weight of the aircraft. The hard surface under the seat cushions has been removed and replaced with a woven fabric. The added benefit of arriving to that important business meeting feeling well-fed and rested cannot be overestimated. In my case, I had flown the red-eye on jetBlue from Denver to JFK and arrived at 5:30AM the morning of the preview, running on about an hour of sleep. For those flying across the country on business, jetBlue's Mint is an excellent option. It's priced well enough that the business traveler can justify the expense over economy class, especially in comparison to other airlines' business or first class. JetBlue begins their Mint service between New York's JFK Airport and Los Angeles International on June 15th. This October, a route will be added between JFK and San Francisco, California.